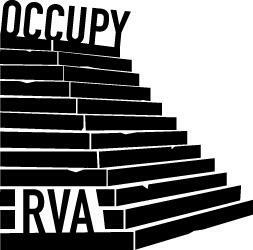 The post Posters Mailed and Distributed to Neighbors of Unhinged Fascist Daniel McMahon appeared first on It's Going Down. Daniel McMahon entered the national spotlight after developing a relationship online over Gab with the neo-Nazi who massacred 11 people at a Pittsburgh synagogue and after working with the “New Right” and pro-Trump publication, Big League Politics, to harass students and antifascists in North Carolina. The following communique and photos was anonymously sent to It’s Going Down and documents how antifascists mailed and distributed informational flyers to neighbors of McMahon in Florida. 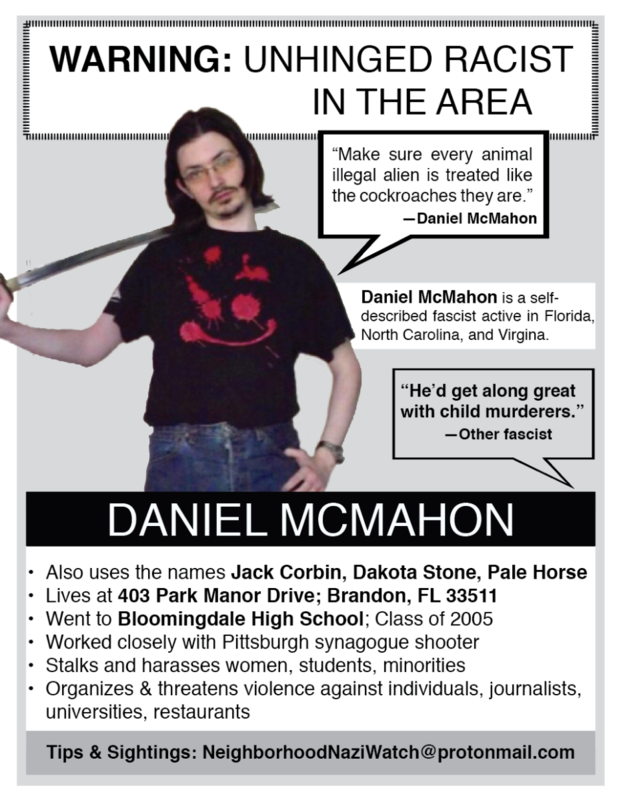 Daniel McMahon is a self-described fascist that is probably best known to people under the pseudonym “Jack Corbin.” However, he also uses the names Dakota Stone and Pale Horse. He’s the kind of fascist that other fascists think is unbalanced and has been thrown out of and feuded with a number of fascist groups like Identity Evropa, Pioneer Little Europe, and the Traditionalist Worker Party. It led to a pretty telling comment from a fascist commenting on Bradley Griffin’s website, Occidental Dissent, that Daniel would “get along great with child murderers.” A woman in far-Right circles told Emily Gorcenski, an anti-fascist researcher, that she was concerned about Daniel’s mental state and was afraid of what he might do. And Daniel McMahon certainly does get along with murderers. Not only did he correspond and work closely with Robert Bowers, the fascist who shot and killed 11 people at the Tree of Life synagogue in Pittsburgh, he’s spent countless hours defending and praising the likes of James Fields and Dylann Roof. He himself is involved in the targeted harassment of students, anti-fascists, POC, and Jewish people and attempts to incite harm with a stream of extreme threats filled with bigoted, sexist, and violent language. Posing as “Dakota Stone,” he impersonated a law enforcement official in an attempt to get a University of North Carolina student newspaper to send him high resolution photographs of student protesters. While Daniel McMahon has been outed online by Philly Antifa and written about by Right Wing Watch and the SPLC, nothing has stopped his harassment, violent incitements, or ability to carry his threats out in the local community and beyond. We know that if we don’t watch out, nothing will be done. We are the Neighborhood Nazi Watch. We’ve sent Daniel’s neighbors copies of the flyer seen here to warn them about the unstable fascist living near them. We’ve also wheat-pasted some around the neighborhood where Daniel lives with his parents.